I’ve always been a shy person. I have become a lot more confident as I’ve grown older but I would still classify myself as shy. Opening up and interacting with kids at a party may be difficult for some youngsters. Here are some fun ideas for interactive party games that will help every child to enjoy the party experience. 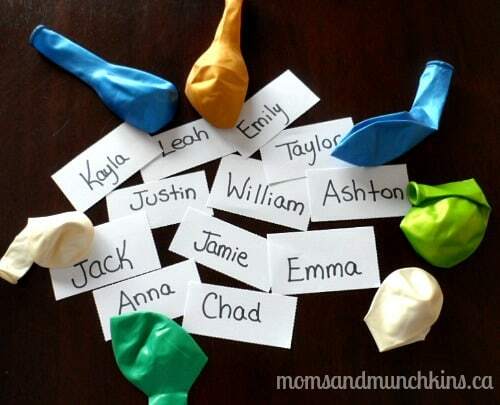 Name Tags: Although this isn’t one of the interactive party games, each child could be given a name tag when they arrive to the party. Trying to remember everyone’s name at a party can be difficult so this will help the kids (and adults) remember. Introductions: Once all of the little party guests arrive to the party, do a quick introduction of everyone. Each child can be asked to say their name and one fun fact about themselves (like a favorite movie or the best place they’ve ever travelled). This is also a great way for kids to find out what they have in common with each other which can help start conversations. Randomly Select Partners: Rather than have kids choose their own partners for party games, take it upon yourself to randomly assign partners. If you’ll be playing a few different games where partners are required, switch the partners between games so different kids are working together. It’s a great way to introduce new friends plus make sure that no one feels left out. Group Project: You can start the party with a group project like a craft where all the kids have to work together to complete it. A fun example for an alien-themed party is for the kids to work together at building a UFO out of a large cardboard box. What are your best tips for interactive party games for kids? When you arrive to a party, do you ever have problems introducing yourself and starting conversations? We add new ideas for parties all the time! Stay updated on the latest party ideas by following us on Facebook, Twitter, Pinterest and Bloglovin’. Kids of age group 3-5 can feel shy in party if they are attending party first time. you have suggested some really great tips to start conversation and its the best way to make friends. Name tags is also innovative idea so not only host but also little guests can know each others names. PS. For interactive party games, how about relay races with large teams (assigned at random), or classic group games like telephone, Simon Says or duck duck goose? It seems like it’s easiest for shy kids to get involved when there’s one large group game.